Cruise ships are not commonly thought of as family vacation vessels. However, there are a fair amount of cruises, like Carnival’s “fun ships” targeted at fulfilling just this purpose. Look at it this way: you know the kids are not going that far, unless of course they have gone overboard. Also, there is a little bit of something for everyone in all age groups. From adults, to teens, to kids, there is are coordinated activities as well as focused facilities for all of the different age groups. You can rest assured that no one will be bored on a family cruise. For parents there are the usual activities. Your rest, relaxation and rejuvenation is certainly the focus and you can spend all the time you’d like lounging by the pool or on the deck, as well as making appointments for a massage or facial. There is plenty of evening recreation for once the kids are in bed, and it varies from ship to ship. There are also great opportunities for socializing and networking, and it is a good idea to have either a small notebook on hand, or at least copies of your card to give to new friends and contacts. There are also wine tasting groups, exercise rooms and nightclubs are on the adults only agendas for most family cruises. For kids, there are all kinds of activities on board family cruises. 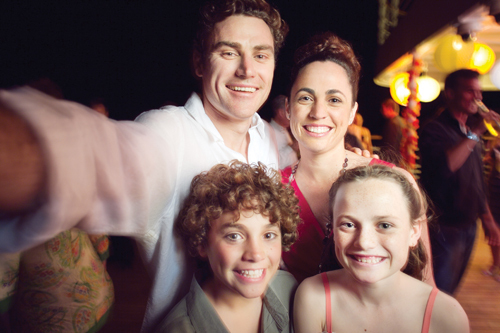 From special times in the pool, to special gym classes, the kids are at least seemingly the focus on a family cruise. There are also children’s centers focused on entertaining the kids and keeping them busy while the adults enjoy their alone time. There are craft activities and fully certified staff to work with your most precious commodities: your kids. If you have older kids, there are also teen centers on board some cruise ships. This is becoming a more and more popular trend. In fact Coca-Cola recently teamed up with the Carnival cruise line to bring exciting new teen centers to their fun ships. These teen centers have been created out of extensive market research and include dance floors, jukebox listening stations, a mock bar with non-alcoholic specialty drinks and space for the teens to just hang out. This is a revolutionary concept, since teens are a previously untapped market in terms of cruise line focus marketing. Teens are also more likely to find things that they enjoy in the ports of call than will younger kids, simply because they are more independent. One reason that cruises are a great idea for family vacations is that most of the costs are included in the base price of the trip. While you are on the ship, things like meals and activities are for the most part covered. This is great because you do not have to give per diems to your kids and you can know up front how much your vacation is going to cost. Of course, you will want to have extra money on hand for when you leave the ship and get to do some real travel.